Because of their versatility, mini-split systems are ideal for a wide range of applications. They've been used to deliver supplemental heating and cooling to computer server rooms, electrical control rooms, detached offices, garages, sunrooms, and building/home add-ons. If a building has no attic or a low pitched attic so ductwork can't be installed, a ductless mini-split system makes it possible for the property owner to still get indoor heating and air conditioning. In some cases, a ducted mini-split system can be installed, usually across a drop ceiling, so that the unit can heat or cool a few connected rooms or used to create one or more smaller heating and air conditioning zones within large homes. 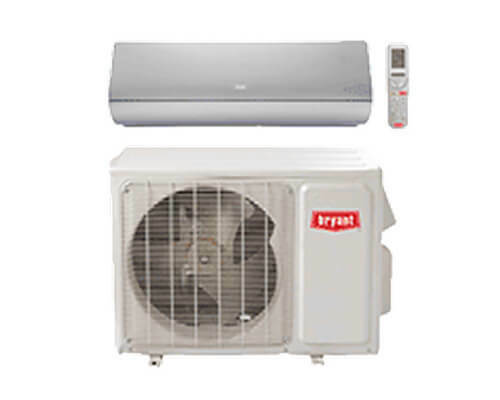 At Long Beach Heating and Air Conditioning, we proudly sell and install Bryant® mini-split systems. These high-performance systems deliver reliable heating and air conditioning and are all quiet, programmable, backed by excellent manufacturer warranties, and energy efficient (with SEER ratings ranging of up to 30.5). With such a diverse range of single-zone and multi-zone ductless systems, we have mini-splits to fit the needs and budgets of homes and businesses anywhere in Long Beach, Torrance, Manhattan Beach, Hermosa Beach, Redondo Beach, Paramount, Downey, Huntington Beach, and beyond. Differences in pricing for most models depends on how much you want to save on your energy bills each month and whether or not you want the latest technological advancements and features, such as wireless remote control, programmability, and advanced system diagnostics. Call us today to speak with one of our mini-split experts and schedule a free in-home consultation. The NATE-certified HVAC technicians at Long Beach Heating and Air Conditioning are exceptionally qualified to repair all major brands of mini-split ductless systems. We've been working on mini-split systems for over 20 years and are familiar with the best practices for servicing and repairing these systems for the best results. We can use universal or OEM parts for repairs and perform repairs under warranty. We can also provide one-time tune-ups and schedule maintenance visits under a Commercial or Residential Service Agreement. Whether you need mini-split sales, installation, service, or repair in Long Beach, Signal Hill, Los Alamitos, Seal Beach, Huntington Beach, Palos Verdes, Downey, Paramount, or the South Bay, give licensed and insured Long Beach Heating & Air Conditioning a call today. We've served over 90,000 residential and commercial clients since 1957 and have been a Bryant Factory Authorized Dealer since 1988. We have an excellent reputation for delivering high-quality, reliable work, exceptional customer service, and fair rates. We're available Monday through Friday, from 8am to 5pm, and accept cash, check, and all major credit cards. For new installations, we offer 100% financing and a “rent to own” option. We're an approved HERO Contractor, and we stay up to date on local utility and federal rebates that you might quality for. Long Beach Heating & Air Conditioning does a lot of work for our construction company. They install HVAC units into the homes we build and other odd jobs involving AC units. They're the only heating and air conditioning company that we work with and we've been doing business with them for over ten years. Everyone at Long Beach Heating & Air Conditioning is easy to work with and very professional. I'd also like to mention Connie who always gives us wonderful customer service!